Real SOLID 925 Sterling silver.finished on rhodium for a lasting finish. Bracelet & Chain Sets. 925 Silver Jewelry. Will never turn your hand green or tarnish. Solid 10k/14k Jewelry. We have all sizes in 6.5-9". 14k White gold plated over stainless steel. Bracelet & Chain Sets. Will never turn your hand green or tarnish. 15ct man made diamonds. 925 Silver Jewelry. Super ICY you have to see to believe! We also have matching chains! Electroplated with 14k yellow gold. Made out of SOLID 925 Sterling silver. This isn’t brass or stainless steel it’s 100% 925 Silver! Bracelet & Chain Sets. 925 Silver Jewelry. Will never turn your hand green or tarnish. 8-18mm 30-120g WONT CHANGE COLOR OR YOUR MONEY BACK!!! 14k Gold over Sterling silver. Bracelet & Chain Sets. Will never turn your hand green. Solid 10k/14k Jewelry. Won't change color or tarnish. 925 Silver Jewelry. Made in Italy. 14k gold over stainless Steel. 5x real 14k gold electroplated so it won't tarnish or rub off for years. Stamped "14k GP". Bracelet & Chain Sets. Nobody will ever know that it's not solid gold. 17 grams.SOLID & HEAVY! 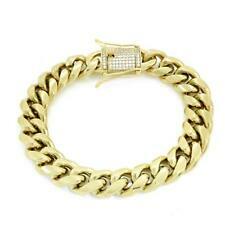 Hand crafted Italian Gold plated Cuban Link Bracelet. Great classic casual look. Very sturdy and durable has great weight to it and very sturdy CZ clasp. Best Triple 14k plated for long lasting Gold shine. Made out of SOLID 925 Sterling silver. This isn’t brass or stainless steel it’s 100% 925 sterling silver. Bracelet & Chain Sets. 925 Silver Jewelry. Will never turn your hand green or tarnish. Handmade in Italy. 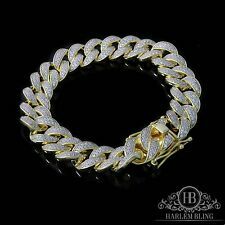 8mm Men's Solid 925 Sterling Silver Miami Cuban Link BRACELET Diamond Cut 8"-9"
30ct lab diamonds. SOLID 925 Sterling silver.finished in rhodium for a lasting finish. Bracelet & Chain Sets. 925 Silver Jewelry. Not plated or filled.this is SOLID silver underneath so even if you scratch it you won’t be able to see because silver underneath! The links are very strong and have a box lock with the two safety clasp on sides. We also have them in various another length. Width 7 mm. Material Gold. Cut Very Good. we will make sure you are 100% satisfied with your. Gorgeous baguette stones. Solid 925 silver. 15ct lab diamonds. Bracelet & Chain Sets. 925 Silver Jewelry. Will never turn your hand green or tarnish. Not plated or filled.this is SOLID silver underneath. 20ct lab VVS diamonds. 2000 micropaved lab diamonds for a total of 20ct. 15mm thick. 14k gold over stainless Steel fully iced out. Stamped 14k. Bracelet & Chain Sets. Nobody will ever know that it's not solid gold. - Hand crafted and PVD plated in 18k Yellow Gold. 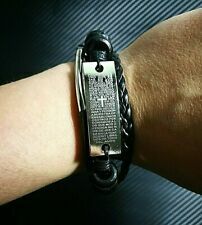 (The Highest Quality Plating Available) - Bracelet Length: 7.5 inches - Bracelet Width: 10 mm - Includes a custom black leather Gold Gods carrying bag. It is Real 10 k Gold, Professionally tested. Style Miami Cuban. Clasp Type Box. Our Diamonds Are 100% Natural And Are NEVER Treated Or CLARITY Enhanced.. we will make sure you are 100% satisfied with your. 14k yellow gold plated over stainless steel. Bracelet & Chain Sets. Will never turn your hand green or tarnish. 925 Silver Jewelry. 12mm thick. Clasp is solid 925 Sterling Silver. Bracelet is solid stainless Steel! Go to any jeweler and get the clasp tested.it's solid sterling silver.not plated or filled. Clasp is adorned with 1ct of handset simulated diamonds (CZ). 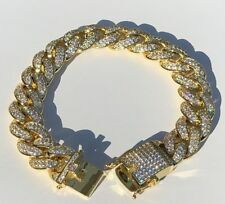 New ListingMens Gold 925 Silver cuban Link Bracelet - New! Mens 925 Silver cuban Link Bracelet gold plated. NEW Men's 8.5" long 8mm wide bracelet 13.5 grams Handmade in Italy. Two tone diamond cut on one side and flat plated on the other. Its reversible so you can wear any side you like! Made out of SOLID 925 Sterling silver with gold plated. This isn’t brass or stainless steel it’s 100% 925 Silver!!! Electroplated with 14k yellow gold for a stunning two-toned look! Diamond cut so it shines nice in the sun!! Heavy and solid feel. Does not fade!!!! Solid 925 silver. Will never turn your hand green or tarnish. Not plated or filled.this is SOLID silver underneath. Heavy 52 grams. 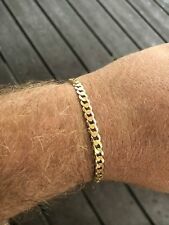 10k Real Gold Men's 13 mm Miami Cuban Bracelet, link, Box Lock, 8.5 inch, Rope,N. Shipped with USPS First Class Package. Photos are of item you will receive. Clasp is solid 925 Sterling Silver. Clasp is adorned with 1ct of handset simulated diamonds (CZ). Bracelet & Chain Sets. 14k white gold over stainless Steel. This is the real deal. Solid 10k/14k Jewelry. 14k gold filled cuban link with pendant . Shipped with USPS Priority Mail. It's a more rich gold color! What you choose is a personal preference. 18k gold over stainless Steel. Clasp is adorned with 1ct of handset simulated diamonds (CZ). Bracelet & Chain Sets. Nobody will ever know that it's not solid gold. Solid 14k yellow gold! Not plated or filled.100% gold! 2.7 grams semi hollow (so it looks like a much bigger bracelet without being expensive). Bracelet & Chain Sets. Gorgeous Italian unisex bracelet. 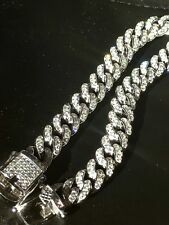 High Quality 7"925 STERLING SILVER ICED OUT LAB DIAMOND CUBAN LINK BRACELET. Main Stone: Micro Pave Lab Similar Diamond. With 925 Stamped. Material: 14k White Gold Finish. Main Color: Silver. High Polish.